The fields at the Camel City Elite Invitational have been set and two elite high school talents have been granted opportunities to test themselves against professional competition on February 2 at the JDL Fast Track in Winston Salem, North Carolina. Trenton Central (NJ) High School junior Athing Mu and Ripley (WV) High School senior Victoria Starcher are scheduled to compete in the women's 800 meter and 1-mile races, respectively. The JDL Fast Track's Twitter page calls it the "fastest 200m flat track in the country." Mu, a burgeoning star in the 800m, will get her first taste of a senior level race, as the 2:06.59 indoor half-miler will face 2016 Olympian Ajee Wilson, multiple NCAA 800m champion Raevyn Rogers and 2015 World Championship silver medalist Melissa Bishop. The national indoor girls record is currently 2:01.78. Very proud to announce that the #CamelCityElite tradition of finding phenomenal HS athletes to race the pros and collegians continues, as Trenton's star Athing Mu (@athiiing) will race the women's 800m and WV miler Tori Starcher will race the women's mile. Good luck on Feb 2! A year ago, the winner of this vaunted event, Hanna Green, authored a finishing time of 2:02.58--in a race that was won by four-tenths of a second over Hanna Hermansson--while the rest of the field ran faster than 2:10. Starcher, meanwhile, will go up against Mammoth Track Club's Grace Barnett, adidas' Charlene Lipsey, Juventus Track Club's Angel Piccirillo and a host of others. No runner ran the mile race slower than 4:53 a season ago. Over the event's six-year history, the Camel City Elite Invitational has been able to grab headlines with big prize money and remarkable talent, including the likes of Lolo Jones, Shannon Rowbury, Nick Symmonds, Matthew Centrowitz and Paul Chelimo. In 2016, the meet welcomed high school star Drew Hunter into the men's 3K, and the Loudoun Valley stud proceeded to run a national record of 7:59.33. Mu has said recently that her goal in 2019 is to break 2:04 in the 800m. 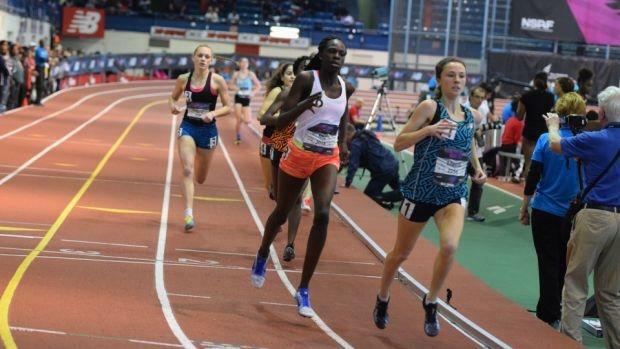 She ran the distance five times last indoor season, including a PR of 2:06.59 at New Balance Nationals Indoor, though the timeline of her trajectory could be accelerated by February -- consider at this time last year she had run 2:17.25 in the event. But Mu's plan is on course for faster times. On Sunday, she posted a US No. 5 time of 24.11 in the 200m and a US No. 1 of 53.54 in the 400m at The Armory in New York during the AAU Mid Season Indoor Invitational. Those times represent significant improvements in both events, and the 400m is third all-time in New Jersey. The high schooler, who runs exclusively for Trenton Track Club, also posted a career best 800m time of 2:04.51 in June of last year at New Balance Nationals Outdoor. Starcher, on the other hand, opened her indoor season on Saturday at the Youngstown State Open and ran a US No. 2 time of 2:10.39 in the 800m. A year ago, the West Virginia runner was one of the country's top milers, producing a runner-up finish in the girls championship at New Balance Nationals Indoor in 4:46.32. A tough cross country season aside, Starcher's main aim will be for huge times over the indoor and outdoor seasons.